speech and language help Archives - Pride Learning Co. Language & Reading: What’s the Connection? 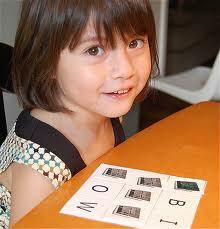 As infants we begin to learn language. We respond to pleasant voices by smiling, we turn our heads when we hear sound, and we begin to babble. These emergent language skills continue to grow and develop over the first few years of life to more complex unconscious abilities such as storytelling, developing and understanding humor, making judgments as to the appropriateness of content for certain listeners, editing for errors, learning metaphors, similes, antonyms, synonyms, etc. Although many children acquire the most basic and fundamental components of language such as vocabulary, generating a sentence, and grammar, they fail to learn the more complex language skills. Reading requires the ability to unconsciously define words, recognize synonyms, antonyms, and homonyms, identify parts of speech, recognize grammatical errors, recognize multiple meanings, etc. Therefore, reading is a language-based skill as it utilizes all of the same processes of an individual’s complex oral language skills. If an individual is unable to develop complex oral language skills, they are unable to develop the skills necessary to be a successful reader. Speech and language intervention is an essential component to the achievement of a successful reader for those who are challenged academically! Intensive treatment supports the development of advanced language skills, which in turn support the skills necessary for reading. Jackson Jade Speech & Occupational Therapy customizes treatment programs that are designed to innervate the areas of the brain responsible for language development, which target the fundamental building blocks for reading including phonemic awareness, phonics, vocabulary development, fluency, and comprehension. Research indicates that stand alone school-based programs are not intensive enough to meet the needs of struggling readers. Children who are enrolled in intensive programs and those who receive early intervention tend to score higher on cognitive and academic achievement measures than those who do not receive intervention or rely on school-age treatment alone. If your child is struggling with reading there are several things you can do to support their development. In addition to seeking school-based services, enroll them in a reading-based program that uses a multisensory approach and seek a comprehensive language program through a speech language pathologist that specializes in brain based development. Renée Firby, MS CCC-SLP is a speech language pathologist and executive director of Jackson Jade Speech & Occupational Therapy. Ms. Firby has extensive experience working with medically, educationally, and cognitively challenged individuals. She has provided speech language pathology services to infants through the geriatric populations ranging from the mildest to most severe impairments. If you have any questions or would like information about scheduling an appointment at Jackson Jade Speech & Occupational Therapy call 888-808-7838 or visit www.jacksonjadesp.com for more information.